Ellery Wygal, 5, takes advantage of a recent nice day at Melvin Miller Park in Urbana. Melvin Miller Park will be bustling with activity this evening and all day Saturday with ParkFest! Urbana Community ParkFest! begins this evening, coordinated by the Urbana Parks and Recreation Department with the support of numerous sponsors. From one end of the park to the other, the festival offers a full schedule of live music, several tournaments such as tennis, sand volleyball, disc golf and pickleball, two pool parties, a fishing derby, tethered hot air balloon rides, a cruise-in, beer and wine tasting, and food and beverages. The park is located at 731 Childrens Home Road and is accessible from Park Lane. 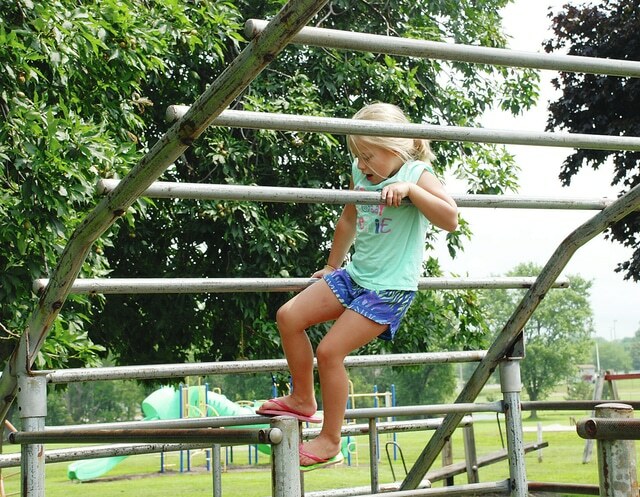 Many events are free, while a portion of the proceeds from others will help support a new Capital Improvement Fund established for the city of Urbana’s parks and recreation facilities. -Concert on the park stage by Above the Law rock band, 6 to 10 p.m.
-Passport to Fishing program for youths, 6 p.m., at the pond, by the Ohio Department of Natural Resources. Free registration on-site (bring your own bait). First 50 kids receive a free rod and reel. -Classic car cruise-in, 6 to 9 p.m.
-Save a Life public pool party by Suicide Prevention Coalition, $5 donation, 7:30-9:30 p.m.
-4-on-4 co-ed sand volleyball, 9 a.m.
-Family corn hole, 9:30 a.m.
-Unto Him, gospel, 11:30 a.m.
-Four Guys, bluegrass, 12:30 p.m.
-Mike Fittro, classic rock, 1:40 p.m.
-Spring & Fall, country rock, 2:30 p.m.
-Mike Griffith & Friends, gospel, 3:30 p.m.
-Muleskinner Trio, classic country, 4:45 p.m.
-No Strings Attached, country rock, 7-10 p.m.
Food and other vendors will be open 8 a.m.-8 p.m. and a beer truck will be open noon to 10 p.m.
-Two-mile run, registration 8 a.m., start 8:30 a.m. at Champaign Family YMCA and finish at park. Sponsored by Suicide Prevention Coalition and the Y. -Urbana Bluegroove Remote Control Raceway (east side of park), 8 a.m. to 10 p.m.
-Urbana Fire Department water games, 1-3 p.m.
-Tethered hot air balloon rides, 6-9 p.m.
-Ohio Caverns hot air balloon launch from park, 6 p.m.
-Champaign County Citizens for Canines selling pavers for the walkway at the entrance of Fido’s Field dog park. Canine friends, on a leash, are welcome. For more information, or to volunteer at the festival, contact Cheryl Wade at urbanaparkfestival@gmail.com or the city park office at 937-652-1053.